This week, we finished resealing the Arthur Foss‘s number four cylinder head, with lots of help from The Anchor Program. Every year the Arthur‘s engine gets better and easier to work on. The last five years of classes and some very involved maintenance has gotten all the parts freed up and we’ve acquired more of the tools required to easily accomplish repairs and maintenance. The engine sounds great, too – when running unloaded and slow we still have every cylinder firing. Nothing focuses a group like urgency. I began work with the Anchor Program on Tuesday to prepare the Arthur Foss the fireboat Duwamish and the Historic Ships Wharf at Lake Union Park for the annual high school Engineer for a Day class on Friday. 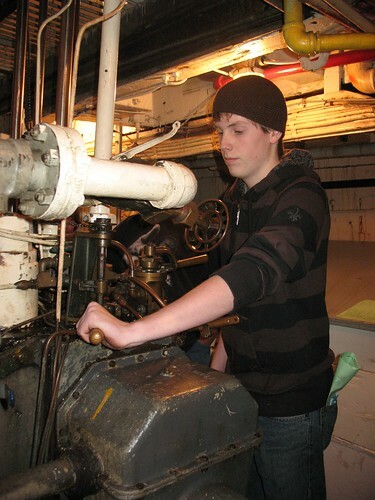 The class teaches kids from the Ballard Maritime Academy about marine engineering and goes from the Arthur to the Duwamish to the steamer Virginia V to learn about each system. Like Arthur, the class gets a better every year. With TAP’s help, we got all the engines running on both the fireboat and the Arthur, despite dead batteries, broken fuel lines, and dirt and grime everywhere. We had the main and both generators going on Arthur and both generators and the three mains on the Duwamish all going. It was great! TAP also helped us get the wharf cleaned up and the fireboat pressure-washed and the tug scrubbed. Thanks for all your help, guys – we’ll have more work days like that soon. On Friday morning, three engineers stood on the Historic Ship Wharf next to three historic ships open and inviting with eight diesel engines warming up for class. We were more prepared to day than the previous 3 high school classes down here. 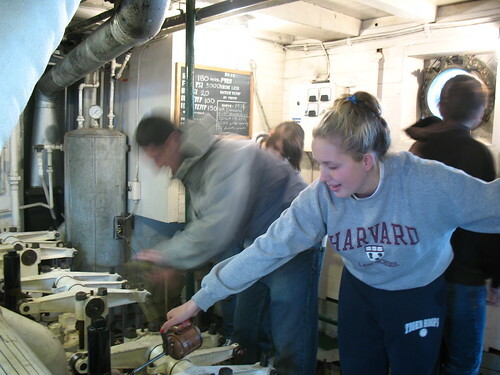 For the fourth year, our Ballard High School class got to experience a marine engineer’s work and realize that the is the same even when the engine room is wildly different. They visited a reciprocating steam plant, a direct-reversing diesel plant, and a diesel electric plant all in the same day visit. They prepped and started up many engines throughout the day to give them the full experience and demonstrate how to operate the engines. We did have one setback: the starter in the fireboat’s main generator went out, so the class exercise was a little limited, but part of why we hold the class is to exercise the equipment and try to find problems before they become larger issues. I would call the class a great success and we’ll fix that starter soon. We kept working on the fuel injectors diesel yarder in Eureka. This is the part of the job that is hard on the hands and fairly boring, since I insist that all the parts thread together interchangeably and entirely. It’s common for parts of these antique diesel engines to distort: the threads stretch, they rust, and tips flare the mating surface. Also, years of using pipe wrenches instead of spanner wrenches and hammers instead of heat beats the parts up further. I machine and lap everything and test every part against every other part to get them all fitting right. The process is tedious but it increases confidence when assembling, since every part fits the way it should. We dove into the Lightship No. 83 project this week: OTM Inc’s first task as Project Manager is to assemble a plan and supporting documents (like charts and tables) and prepare specifications for when we request bids for the work. It’s not like hammering on the hull or tracing leaks in the plumbing, but it’s really important work and it’s great to finally start on it. Jay recently bought a new storage container and had me lead the move from the old container to the new. Changing storage areas like this is a good time to inventory and organize the stuff you’re keeping with your boat and make sure that you’re holding onto the right things. Every time I do this for a client I find tons of parts that don’t fit the engine they are intended for. Since holding onto the wrong parts is a waste of space and effort, I try to arrange trades or sales of the wrong parts and get the right parts instead. The Maris Pearl has a Q Enterprise, but many of its “spare parts” that Jay has been storing are for a G or R Enterprise. I’m working on trading them in to Striegel Supply for store credit, but if anyone reading needs parts for a G or R Enterprise, or has parts for a Q Enterprise, maybe we can arrange something. On Saturday, OTM Inc met with representatives from the Northwest Seaport and the Center for Wooden Boats about holding another Classic Workboat Show. After some discussion, we decided that it was too soon to hold another show featuring tugboats, but holding a Classic Fishboat Show is doable for this fall. The Classic Fishboat Show this fall will be great, but Old Tacoma Marine Inc won’t be as heavily involved. The 2009 Classic Workboat Show, though, will be epic, with even more heavy-duties, more events, and hopefully a big crane barge demonstration. We’re already looking for sponsors and donors, so give us an email if you’re interested or know someone who’s interested. To complete the festive atmosphere, Ballard Brothers Seafood & Burgers set up a booth selling their famous blackened salmon burgers and the jazz trio Bar Tabac played old-timey music on the docks and the boats. We even set up a pub, sponsored by Pacific Maritime Brewery. The best moment was at five o’clock, closing time for the show. All the workboats sounded their horns, whistles, sirens, and bells at once. It was totally unplanned except for me telling everyone to blow their noisemakers at five, and it became this amazing workboat symphony. I can’t even describe how awesome it is, you’ll just have to listen to it yourself. It was an amazing day and I think it will be tough to beat. The fishboat show this fall will be great, but I think that the 2009 Classic Workboat Show will be even better. I hope to see everyone there. If anyone reading can help with the 2009 Classic Workboat Show, we need sponsors, visiting workboats, volunteers, and cash (and see if your employer has a program for matching funds, since it’s a great opportunity for sponsors to get their names out there). Donations can be earmarked for the show or for other programs. Email me or Northwest Seaport to help. Finally, this week Chris from Utah sent pictures of the only two-cycle single-cylinder Atlas-Imperial diesel engine I have ever heard of. If anyone reading this knows of another, please let me know. We borrowed the two-cycle Atlas-Imperial manual from Dan and scanned it for you to read. I read through it as well, and it seems like Atlas stole the idea straight from Fairbanks-Morse. What do you think? Read it and let us know on the Discussion Board. Speaking of scanning original diesel manuals, Old Tacoma Marine Inc scanned a whole bunch of original heavy-duty manuals and catalogs this week to post on the website as a resource to enthusiasts, operators, and history geeks. We’re still getting them formatted for the web, so stay tuned. Meanwhile, what manuals do you want to see scanned and posted on the web? Make a request and we’ll track it down and get it up–as long it isn’t about lawnmower or washing machine engines. Heavy-duties only. Guy [formerly] from Kodiak, who sent us the great photographs and information about the Kodiak Maritime Museum’s Washington Iron Works engine, visited Seattle on Saturday and called to ask if he could see some old engines. We were happy to help – we sent him to the Northwest Marine Propulsion Museum to see their Washington and to Northwest Seaport to see the Arthur Foss’s Washington. It’s too bad that he didn’t get to see them run, but he’ll just have to visit again during a demonstration. This has been a busy week for Old Tacoma Marine Inc. In addition to our usual winter maintenance load, the museum program schedule is picking up and we’re getting a lot of interest in old diesels following our increased web presence. Jay, Charlie, and I started the week by moving the Maris Pearl from Lake Union Dry Dock back to Shilshole Marina. It was a pretty uneventful trip. OTM Inc checked in with Alaska Copper and Brass again about the cooler for the tug’s Enterprise diesel. Wayne reported no progress, so I threatened to go down there and roll the tubes myself. Next Monday, I think I’ll show up at their plant with my work boots and hard hat. I also talked with Rick Hamborg, new owner of the Red Cloud, about the extra control head that I’d like to purchase for the Maris Pearl. I think we might be able to reach a deal soon. Everett Engineering did a great job, although Dan Martin overrode my request for more fore-and-aft thrust clearance so that the tight fit will hold oil better. I’m afraid that it will be much harder to center the bearing every time the propeller shaft is engaged. The clutch on the Arthur Foss uses a set of links that flop over-center in a way that maintains pressure on the clutch without force from the throw-out bearing. When the throw-out bearing is backed off a little, there is no thrust pressure at all. The centering is sometimes hard, as the big wheel that moves the bearing is touchy. We’ll probably want to engineer a clamp or holder of some type to maintain the bearing position while underway. The collar and bearing were installed on Thursday, but the links need to be cleaned. They’ll be installed early next week. I talked with Jeffrey on the David B, which is hauled-out in preparation for propeller work. They also want to replace the stern bearing due to the 1/4 inch clearance recorded, but the rudder is in the way of the bearing housing. It looks like Jeffrey will need to remove the short intermediate shaft in order to remove the bearing housing, but the tail shaft will be even harder to remove. I’m wondering if they’ll replace the bearing without cleaning the shaft lining. Jeffrey’s frustration makes me think so. The Catalyst’s owners have reached an agreement with Empire Motors to purchase the three new cylinder heads (previously mentioned here) as well as the patterns. I’m really looking forward to seeing them and I hope they work. I’m also really, really excited to see the patterns. I’ll post lots of pictures when they get here. Steve from Striegel Supply is looking for some Fairbanks-Morse parts for a blower on a 16”-bore engine. I don’t know who would have these parts—does anyone reading this have any ideas? Leave a comment – or better yet, post on our discussion board! I talked with John in Maryland this week. He has a Fairbanks-Morse FM–A—6 engine, like the one on the John N Cobb. He’ll be sending us photographs and information soon. He’s also trying to locate spare parts just in case; I recommended Hatch and Kirk overhaul the injectors and pumps for him. OTM Inc received an email from the Columbia River Maritime Museum in response to a letter we sent informing the museum of some small problems with their Atlas-Imperial on display. They don’t want to work on the engine right now (especially since it’s on display in the main lobby – though I think that working on it right there would be very interesting for visitors), but they do want a list of what to do and how to do it for future planning. I’ll come up with a detailed list and maybe make a copy of one of our manuals to hand-deliver in March. I am a volunteer with the amphibious forces memorial museum. Last October we sailed the Sakarissa from San Francisco to Portland Or. She is moored on the Columbia River next to our Landing Craft Infantry 713. I was looking on your web site and we have a Enterprise engine on the Sakarissa and it is a beautiful engine. You can visit our web site and see more, or contact them for some good pictures of the engine. Preparing for a course like this is a hectic process, as the boats always require some head-scratching and jury-rigging to get them running after a long idle period. The biggest puzzle we faced this time was getting enough air pressure to start the fireboat Duwamish’s diesel-electric system. The fireboat’s air compressors need a little work; one of them really doesn’t pump air at all, and the other one’s efficiency is suffering. It takes a long time for it to fill the tanks up to the minimum level needed to turn the main over, so for past Engineer for a Day programs we’ve run an air hose from the Arthur Foss to the fireboat to fill up the tanks. This past autumn, though, we moved the boats on the Historic Ships Wharf around so that the Arthur and the Duwamish are separated by a big old Lightship (number 83). If we use a long enough hose to stretch up and over the lightship and down into the fireboat, it doesn’t effectively fill up the tanks. Grant and I spend most of Thursday running the air compressor on auxiliary generator, wondering if we’d get enough pressure to turn on the main. We thought about renting an air compressor, but couldn’t find a large enough one on short-notice. We ran it and the generator for a while after that to ensure that we had enough air built up to start the engine several times, since that’s a key part of the Engineer for a Day program. While Grant was working on the Duwamish, cleaning and oiling and turning over the three big Bessemer generators, I was doing some work on the Arthur Foss. We’d removed the base doors during the autumn 2007 Diesel Engine Theory course (pictures at Northwest Seaport’s Flickr account), and I needed to re-seal them using my own patented “goo” method. Five of these doors are the original aluminum with “Washington Iron Works” cast into them, but one is a replacement made of plywood. Northwest Seaport’s museum specialist is hoping to replace this replacement door with a piece of thick plexiglass so that we can see into the engine while it’s running, but they weren’t able to get it purchased and cut in time for this class. They’re aiming to get it installed in time for the summer tour season, though. I doubt that they’ll be able to see much through all the oil that’ll get splashed against the door while the engine is operating, but it’s a neat idea and no harm in implementing it (at least until I have a new door cast in aluminum). The Virginia V at least was ready to go — though this is only because we don’t start up her steam plant during the Engineer for a Day program (it would double the cost of the class). Her power plant is currently disassembled for winter maintenance, but that actually makes it even more interesting to observe. Despite this, I’m always a little nervous thinking about a big group of kids storming the boat. Once they arrive and we break them into three groups to cycle through the Arthur, the Duwamish, and the Virginia V, I usually calm down. They may be high schoolers, but they want to be there and are way smarter than I give them credit for — even if they play games and whisper and text message while they’re supposed to be listening. I had a great time leading them through the Arthur’s start-up and shut-down procedures, and both Grant and Gary say the same thing about their sections. I’m looking forward to doing as many of these as we can, and not just for Ballard Maritime Academy. The week finally ended with OTM Inc helping run a new program with Northwest Seaport and the Center for Wooden Boats. 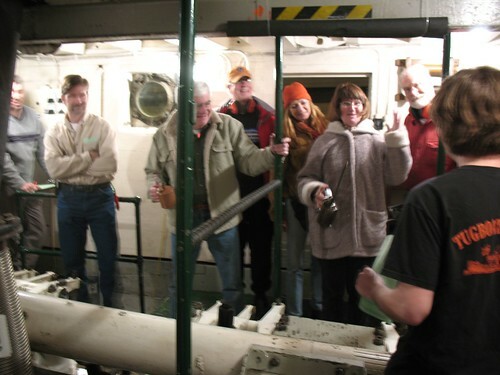 Tugboat Night was designed to serve three different purposes: to provide a regular, low-cost program on the Arthur Foss, to exercise all of the tug’s equipment more often, and to get more people onboard and involved with the boat and the organizations. This, however, is the great thing about Tugboat Night. Next time, we’ll do it differently; we could have other instructors up in the fo’c’sle or the wheelhouse while I stay in the engine room and let participants choose where they go, or we could spend less time on the pre-start checklists and just turn things on and off. We could have a “plumbing night” or a “wiring night” or a “steering and telegraph night,” as well as a “deck department” or an “engine department” night. I’m really excited by the turn-out of this first session, since it shows that people are interested in learning about the gritty details of old boats. I think that it’s a great way to start building a volunteer engine crew for the Arthur, both to help keep up with maintenance and repair, and for in the future when the tug starts cruising again (though that’s barely on the horizon). I hope that see all the same people at the next Tugboat Night, plus more who hear about it from them. 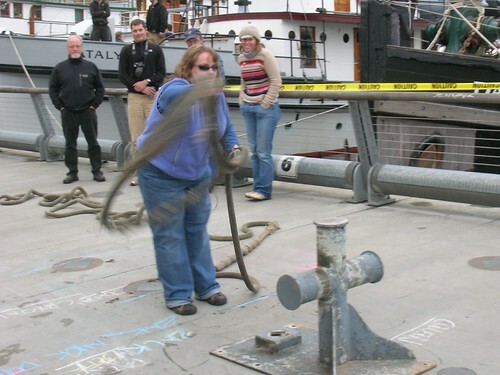 NWS and the CWB have scheduled four more sessions of Tugboat Night, on April 19, June 21, August 16, and December 20. Depending on the popularity of the class, they may hold more this year, and they’re planning to hold one every month of 2009. Call the CWB at (206) 382-2628 to register now. Kirtland (a boat guy living aboard the Arthur Foss these days in a work-exchange arrangement with Northwest Seaport) and I had a “discussion” the other day about paint on boats. It went sort of like the Bud Light “great tastes” versus “less filling” commercials. It is my philosophy that paint is an impermeable barrier that protects the ship from rot, rust, and other elemental damage. It is Kirtland’s philosophy that paint is a cosmetic that keeps the boat looking sharp and shipshape. Of course, what we actually said was something like “Next time, use tape, [censored]!” “You want tape? Beat me to it, [censored]!” and back and forth several times. Now, I’m a big proponent of keeping the boats looking sharp so that the maritime groups have good “dock presence,” but before worrying about making them look good we should worry about keeping them protected from the rain and other agents of deterioration. If Kirtland wants to spend a lot of time fussing over masking and detailing and what should be painted green versus white, then that’s fine – as long as the boat is already protected. Readers, what do you think? Paint as protective barrier or paint as a cosmetic detail? Please comment with your opinion.